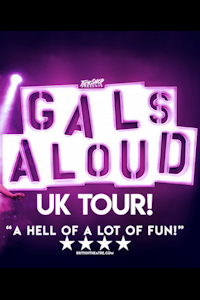 Gals Aloud: Not The Tucking Kind tickets at Southbank Centre, London. 2019. Performers Cheryl Hole (Cheryl), Kitty Scott Claus (Kimberley), Lydia L'Scabies (Sarah), HERR (Nadine), Ophelia Love (Nicola, Tayce (Javine). Gals Aloud: Not The Tucking Kind tickets: The tabs above allow you to select between links to suppliers and date searching. Click on a supplier's logo to see their details and on the 'buy now' button to see and check the tickets on offer.